On December 22nd 2016, the Terra Sancta Museum, including its Library and General Archives office, collaborated with the U. Nahon Museum of Italian Jewish Art, presented a preview of the great exhibition that will take place in the Halls of Curia of Saint Saviour Convent, beginning on January, 2017. The exposition, entitled “Venetian treasures in Jerusalem: following the Lion”, will show for the first time some of the precious gifts that Venice offered to Jerusalem, and in particular to the Custody of the Holy Land. The idea to display these splendid treasures comes from the strict bonds that for hundreds of years have been linking the “Serenissima Repubblica” to the Holy Land. Thanks to its political and economic standing and to its diplomatic actions, for a long time the Serenissima has become the only door opened to the Middle-East. It is mostly due to the efforts of many Venetian Baili (Venice’s diplomats). For example, today we are able to visit the Holy Sepulchre and the Nativity Church, which were at risk of demolition during the XVI century. This exceptionally rich web of exchanges is testified by the many treasures that can be still admired today: magnificent vestments, goldsmith jewellery, pottery and majolica. 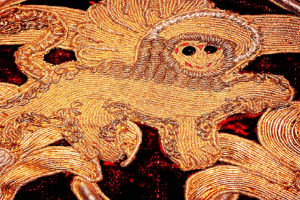 These pieces are recognizable by the Lion’s crest, symbol of the Venetian Saint, San Marco. This mark, present on various embroideries, stamps, vases and candlesticks, allow us to remember this long history by showing the rich Gifts that Venice offered to Jerusalem. 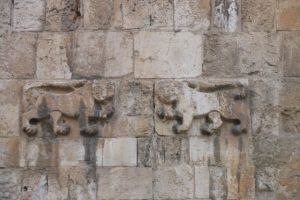 Even today, those who are walking through west Jerusalem and intend to enter Jaffa Street are met by a big lion, overlooking the roof of a building from the thirties. 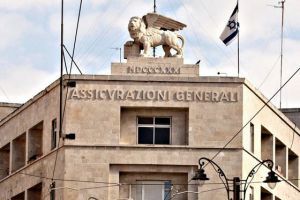 What seems to be the Lion of Judah, symbol of Jerusalem, shows himself as the Lion of St. Marco, looking after the old palace of the General Security, which now houses government offices; …as if for centuries, Venice’s lion was still here to protect and safeguard the Holy city of Jerusalem.